The Old Trade Road of Izumo . A style of architecture, taisha-zukuri, takes its name from the main hall of Izumo-taisha. Some other major festivals are January 1, Omike Festival; January 3, Fukumukae Festival; January 5, Beginning Sermon Festival; February 17, Kikoku (prayer for abundant crops) Festival; April 1, Kyoso Festival; June 1, Suzumidono Festival; and August 6–9 is Izumo Oyashiro-kyo Religion Festival. In October of the lunar calendar, a festival is held to welcome all the gods to Izumo Grand Shrine. It is believed that the gods gather at Izumo Shrine in October to discuss the coming year’s marriages, deaths, and births. For this reason, people around the Izumo area call October kamiarizuki ("the month with gods"), but the rest of Japan calls October kannazuki'' ("the month without gods"). The Grand Shrine of Izumo (Izumo Taisha) in Shimane Prefecture is one of Japan's oldest shrines. 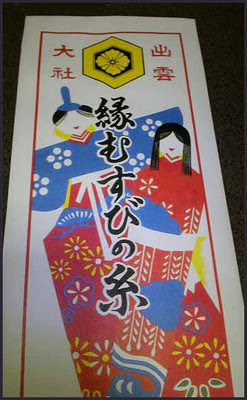 It is devoted to Ōkuninushi 大国主命, the Shintō kami of abundance, medicine, luck, and happy marriages. In Japanese mythology, Ōkuninushi (lit. = Master of the Great Land) built and ruled the world until the arrival of Amaterasu's grandson, Ninigi-no-Mikoto 瓊瓊杵尊. He then gave political control to Ninigi but retained control of religious affairs. In gratitude, Amaterasu presented Ōkuninushi with the Grand Shrine of Izumo. According to Japanese tradition, all Shintō gods meet in Izumo each year in October. October is thus known around Izumo as Kamiarizuki 神有月 (Month with Gods) and everywhere else in Japan as Kannazuki 神無月 (Month Without Gods). Ōkuninushi's Buddhist counterpart is Daikokuten (the god of agriculture and fortune, and one of Japan's Seven Lucky Gods). In addition, Izumo no Okuni 出雲の阿国, the so-called founder of Japanese Kabuki 歌舞伎 theatre, was a shrine virgin (miko 巫子) of Izumo Taisha 出雲大社. She was the subject of a painting genre that flourished in the 17th century known as Fūzokuga 風俗画, and is credited with a devotional dance called Nembutsu Odori 念仏踊り.
. kawari usagi 「変りウサギ」 all kinds of rabbits . is the most important deity, revered at the grand shrine of Izumo.
. The White Rabbit of Inaba - Introcutcion . 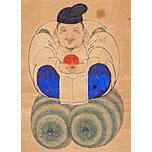 Ōkuninushi 大国主命, the Shintō kami of abundance, medicine, luck, and happy marriages. In Japanese mythology, Ōkuninushi (lit. = Master of the Great Land) built and ruled the world until the arrival of Amaterasu's grandson, Ninigi-no-Mikoto 瓊瓊杵尊. He then gave political control to Ninigi but retained control of religious affairs. Hii-gawa River is the very place where Susano-no-mikoto, younger brother of the Sun goddess, Amaterasu-omikami, descended from heaven. He saw an old couple sobbing in deep sorrow there. He asked what's wrong with them. They told him that there is a monstrous snake with eight heads and eight tails which comes to take their daughters one by one every year, and the time has come when their last daughter would be taken by the snake, called Yamata-no-orochi. The young prince, boasting of his strength, made the snake drunk before killing it with his sword. At that moment, a sword came out from the snake's tail. This is Kusanagi-no-tsurugi sword, one of the three divine symbols of the Japanese Imperial throne. 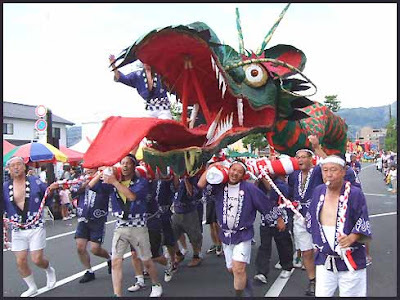 The Izumo Orochi Festival, which is held in summer and autumn every year, is associated with this myth. 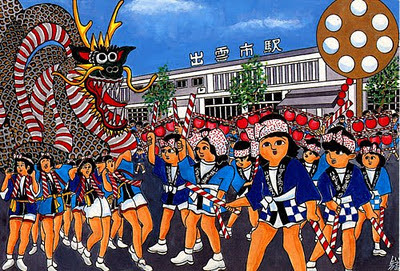 A big fire works festival at the Hii-gawa River bank in summer, and a dancing parade with a 10 meter monstrous snake in autumn, bring out the real feeling of the respective seasons. With shooting performance and shooting from horseback (yabusame). The great summer purification festival at Izumo. was known for the great migration of the Japanese gods. 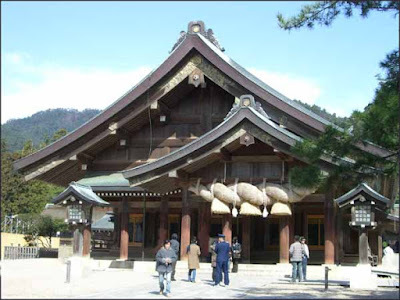 They would all go to celebrate at the great shrine of Izumo, so the rest of Japan was "without gods, kami no rusu". This kigo for early winter could only be used in IZUMO itself, where the gods were present. A tradition of the family Izumo no Kuni no Miyatsuko 出雲国造家 with prayers for peace in the land and thanksgiving for the harvest. Kuni no miyatsuko (国造 - also read as Kokuzō or Kuni tsu ko) were officials in ancient Japan at the time of the Yamato court. They were in charge of provinces (国), although it is not always very clear what those provinces were. Kuni no miyatsuko had most certainly vast powers and were local lords simply "appointed" by Yamato court. Kuni no miyatsuko as rulers were abolished during the Taika reforms, and provinces were reorganized under the ritsuryo system. Kuni no miyatsuko were appointed gunshi, whereas provinces became ruled by kokushi. The post remained after the Taika reforms, but the Kuni no miyatsuko were now in charge of spiritual and religious affairs. A few Kuni no miyatsuko clans however retained influence after the Taika reform, such as the Izumo no Kuni no miyatsuko (出雲国造). Literally, "Celebrations of the First Taste,"
refers to the set of harvest festivals in November carried out at the imperial palace and shrines throughout the country. Complements the Kinen sai, a rite involving prayers for a healthy crop and held in on the fourth day of the second month. In ancient times also called nihinahe and niha’nahi. Motoori Norinaga suggests that, since it appears in the "feting anew" section of the Transmission of the Kojiki (Kojiki den), that it was a festival in which new rice was offered to the deities. As in the ancient Chinese celebration "Name no matsuri," a rice festival held in the autumn, this was a typical festival expressing gratitude to the gods for exercising their powers on earth and bringing about a successful harvest. The origins probably date back to the Yayoi period when rice cultivation began. The niiname sai is mentioned in both the "Era of the Gods" section of the Nihon shoki ("when Amaterasu ôkami honorably performed Niiname") and in the entry for year forty of its "Nintoku" section ("In the month of Niiname, since it was a day of banqueting, sake was given to the palace ladies"). 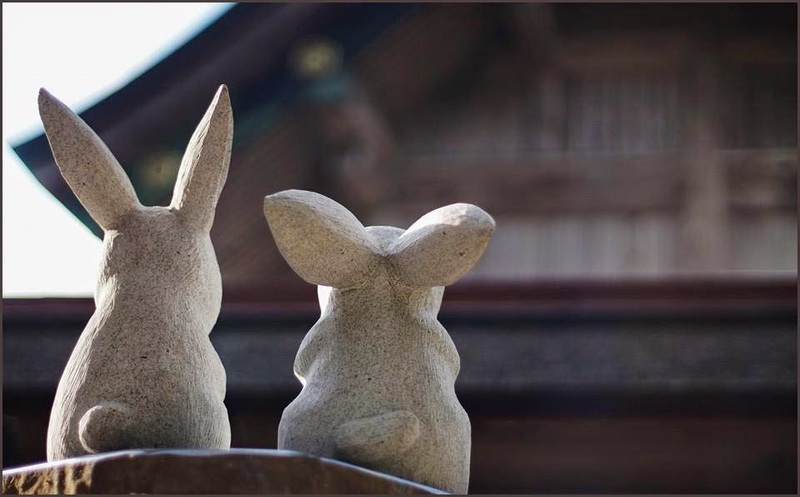 For a long time it was held on the latter "Day of the Rabbit" in the eleventh lunar month (or the middle "Day of the Rabbit" if there were three such days in the month), but with the conversion to the new calendar in 1873, it was changed to the November 23. In the Ninth Article of the 1908 "Prescriptions of the Imperial House Rituals," this celebration is named as one of the Major Rites (tai sai), and listed as occurring between November 23 and 24. For the rite two dais, one for the deities (kamiza) and one for the emperor (goza), were constructed inside the Shinka Hall, then the emperor makes food offerings to Ama-terasu and the many divinities twice, once at dusk on the twentythird and again at dawn on the twentyfourth. The emperor arranges an offering of sake, rice porridge, and steamed rice (made from the newly harvested rice) served in special vessels crafted from woven beech leaves (kashiwa) and presented to the kami on a special reed mat (kegomo). Following this evening meal (yūmike), the emperor purifies himself in seclusion (kessai) for the night and, after changing robes (koromogae), prepares the morning offering of food for the kami. Also listed in Article Two of the "Regulations for Shrine Rituals" of the Association of Shrines (Jinja honcho kitei) as a Major Rite, it is performed at shrines throughout the country to accompany the rites at the palace. Besides the yearly Niiname sai, the one which is the first performed after a new emperor’s ascendance (sokui) is called the Daijō sai. buckwheat noodles from Izumo . Shinkoku, 'The Country of the Gods'; and of all Shinkoku the most holy ground is the land of Izumo," wrote Lafcadio Hearn more than 100 years ago in his book "Glimpses of Unfamiliar Japan." For Hearn, it had been an ambition to visit Shimane Prefecture's Izumo, "the land of gods" as he described it, ever since he learned about it from the "Kojiki" ("Record of Ancient Matters"), the oldest extant manuscript in Japan. Since his visit, the writer's depiction has enchanted many others and persuaded them to visit the site. Izumo is a place of major significance in the legends of the "Kojiki." The city is well known for its Izumo Taisha, one of Japan's most revered and oldest Shinto shrines, which is dedicated to Okuninushi no Mikoto, a deity closely associated with marriage. This year marks the 1,300th anniversary of the compilation of the "Kojiki," while next year, a "grand installation" ceremony of Izumo Taisha will take place for the first time in 60 years. The grand installation marks the return of Okuninushi no Mikoto's spirit, which had been temporarily moved to another location during the shrine's renovations.
. . . In the later half of the seventh century, Emperor Tenmu (c. 631-686) commissioned the "Kojiki" to be the official history of Japan in order to help strengthen imperial rule. It was completed in 712 and the "Nihon Shoki" ("Chronicles of Japan"), another manuscript of myths and legends was compiled in 720. The exhibition starts with Harada Naojiro's oil painting "Susanoo Slaying the Eight-Headed, Eight- Tailed Serpent, Yamata no Orochi (Study)" (circa 1895). In the widely known legend, Susanoo, the rowdy brother of the sun goddess Amaterasu, defeats a monster serpent living near the source of the Iigawa river. The Iigawa was known to be a raging river, which when flooded would threaten the lives of villagers, and defeating the serpent was often seen as a metaphor for controlling it. But the interpretation of this myth is varied and the image of Susanoo remains an enigma. It is believed that one third of the myths in the "Kojiki" are about Izumo, which was once a region of power significant to the Yamato province (modern-day Nara Prefecture), the central regime of ancient Japan. The oldest version of the texts, Volume 1 (1371), a national treasure, is on display, and it serves not only as a reference to the relationship between Izumo and Yamato, but also as a manifestation of a fascinating way to record history. 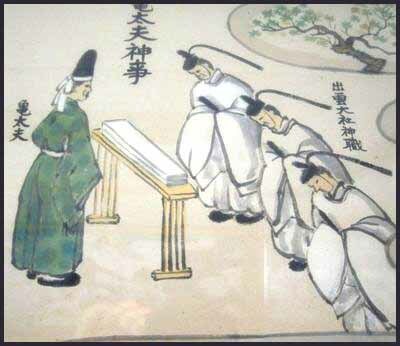 In a tale depicted in the "Nihon Shoki," Okuninushi is rewarded with Izumo Shrine for giving his domain to the Heavenly Grandson, the grandson of Amaterasu. 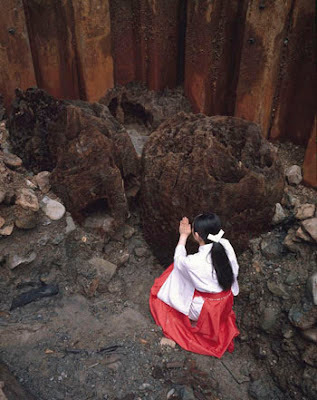 According to oral traditions, the shrine once stood at 96 meters tall, and then later at 48 meters tall. Those measurements seemed unlikely until the discovery of pillar bases on the grounds of the shrine in 2000. The massive size of the bases suggest that they could have supported a structure of 48 meters in height. "The discovery confirms the enormity of the ancient structure as well as endorses an old construction plan of the Izumo Shrine that has been handed down through generations of the Senge family, one of the lineages of the Shinto priests of Izumo Shrine,"
said Katsumi Adachi, the director and curator of the Shimane Museum of Ancient Izumo. This exhibition showcases the excavated uzubashira (axis pillars) for the first time outside Shimane Prefecture. And to give them context, they are exhibited with a large-scale reconstruction of the ancient structure that includes staircases reaching to the heavenly realm. Other great archaeological finds from Izumo include numerous bronze objects excavated from ruins at Kojindani and Kamo Iwakura — all of which have greatly informed historians' view of Izumo's role in ancient Japanese history. A spectacular display of Yayoi Period (about 300 B.C. to A.D. 300) bronze swords and bells, for example, indicate that long before the "Kojiki," Izumo had been a major place of sanctuary and formed a unique culture around the spiritual world. By examining cultural objects related to the history of Izumo, the myths and legends of the "Kojiki" and "Nihon Shoki" can be deciphered. Those two manuscripts represented an official view of the nation's central governments and were designed to justify their rule. However another text, "Izumo no Kuni Fudoki" ("Records of Customs and Land of Izumo," completed in 733), compiled by an ancestor of an Izumo Shrine priest, tells different tales that reflect the view of local rulers. This unprecedented exhibition is based on the results of joint investigations by the Kyoto National Museum and the Shimane Museum of Ancient Izumo, and in it Izumo emerges as a crucially significant region of ancient Japan — both politically and spiritually. Visitors will gain not only a clearer vision of Japan's history, but also a deeper understanding of the Japanese spiritual world and its land of the gods — a place often called the home of Japan's soul. Kuniyuzuri 国譲り The "transfer of the land." Izumo no okuni was the daughter of a blacksmith who started out as a miko (shrine maiden) at Izumo Shrine. She was known for her beauty and her skill at performing sacred dance (kagura). She was therefore chosen to be sent to Kyoto to raise money for the shrine, as was the custom of the age. Priests and other shrine personnel had to act as fund-raisers. The freedom she found in the capital must have gone to Okuni’s head, for she soon turned from sacred dance to the profane. She started performing on the dry river bank of the Kamogawa, and her sensual style of dance attracted large crowds. She added humorous skits satirising the manner of lovers, and she even impersonated samurai and prostitutes. Though she sent money back to Izumo, the shrine authorities were concerned by her reputation and summoned her home. She refused.